Residents gather at the open house for Plano Fire Station 1 in downtown Plano. Plano Fire paramedics respond to residents in need. The Community Paramedicine program helps improve resident’s quality of life through education and preventative care. During his year-end report to the Plano City Council Monday night, Chief Sam Greif said 2018 was an "outstanding" year for Plano Fire Rescue. The year was marked with increases in call volume, new developments and community impacts through education and outreach. Plano’s 911 call volume has continued to trend upward over the last 10 years with 27,842 calls in 2018, over 1,000 more calls than the year before. Plano Fire’s average response time was five minutes and 27 seconds. And 90 percent of the time, Plano Fire responds in about seven minutes, which Greif still considered a successful response time for his department. And even though the call volume increased, Plano Fire has found ways to repurpose employees, open new fire stations and hire new firefighters, all while meeting the high standard people have come to expected in Plano, Greif said. EMS total transports only increased by 1 percent from 2017 to 2018; however, patients 65 years and older increased by 6 percent, a trend Greif said will continue as Baby Boomers age. 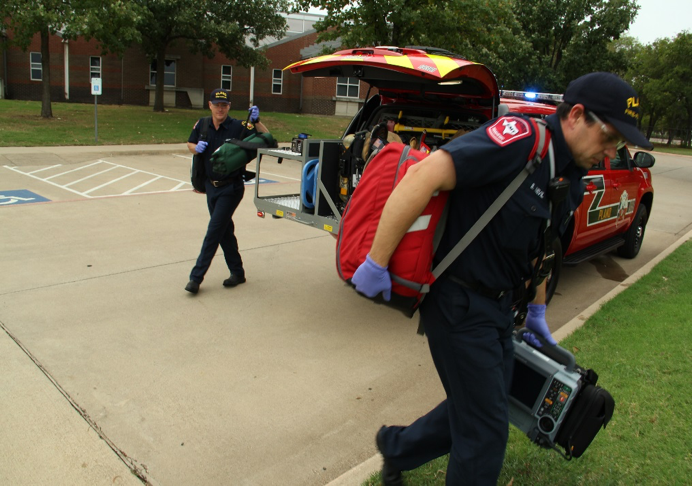 Greif was especially proud of Plano Fire’s community paramedicine program, where EMS officials respond to residents who’ve depended on 911 and emergency services for their healthcare needs, many who have non-life threatening or preventable ailments. The community paramedicine team has worked to educate and connect residents to social services. As the program has progressed, Greif said Plano reported 682 fewer calls than 2017 due to the care and education community paramedics was able to provide. “You have to understand, many times there are mitigating factors as to why they’re having to call 911 so often. And the community paramedics have got a great social network set up, so if they don’t have groceries, they get them hooked up with the food pantry. If they’re eating the wrong groceries because of medical conditions, they make sure they’re eating the right groceries,” Greif said. Whether it’s health or housing, he said the community paramedics' “spider web” of social and community services is improving the lives of residents in need. Fire incidents dropped a bit since 2017, which Greif credits to Plano’s fire prevention education program. And in a customer satisfaction survey, over 400 residents said Plano Fire was meeting or exceeding community expectations, most often exceeding. During 2018, Plano Fire reopened its newly renovated central fire station on K Avenue, acquired a special event truck ideal for festivals and outdoor events, and Fire Station 5 received a new hazmat truck, which should enhance Plano Fire’s ability to mitigate hazardous situations in the city and surrounding communities. Plano Fire is also certified and training drone pilots. Moving forward, Plano Fire’s training center is still in the design stage, but by the end of 2019, Greif hope to moves some dirt and start the yearlong construction process. “It was a good year for us. And we’re grateful for each and everyone of you for the support that we’ve received,” Greif said.